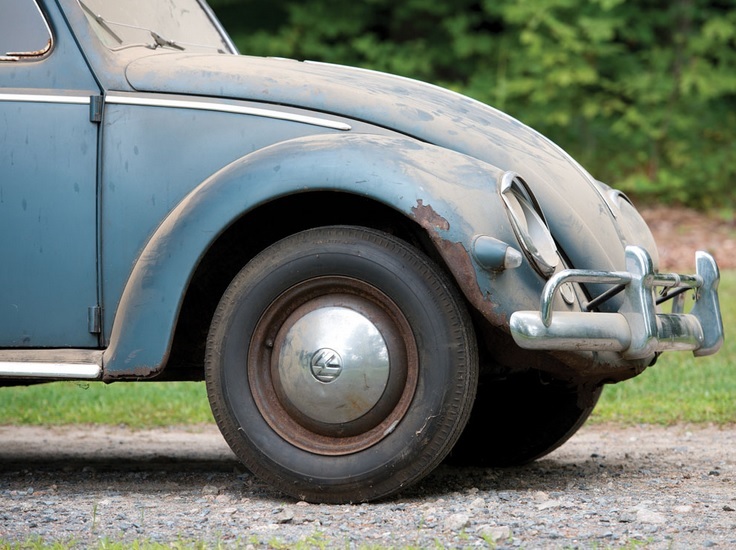 Our friends at Hemmings Motor News are reporting that an unrestored, all-original 1956 Volkswagen Beetle is scheduled to cross the auction block in Hershey, Pennsylvania, next month. Interestingly, the Beetle occupies the “V” spot in New Hampshire-based enthusiast John Moir’s A-to-Z collection of cars that represent each letter of the alphabet. The Beetle was purchased new by Moir’s father in 1956 and almost exclusively used to run short errands. Moir Sr. occasionally loaned it to visiting family members who needed a car to get around while in town, but overall the Beetle appears to have been very sparingly driven in the first few years of its life. Moir Sr. eventually passed the Beetle on to a number of family members including one of his sons and one of his grandsons. The car joined Moir Jr.’s growing collection after it became too worn out to drive on a regular basis.